I run evening classes on TUESDAY EVENINGS 7pm – 9 but current students are given first choice so please email me to see if there are spaces. HAVANT, Hampshire, United Reformed Church hall, Elm Lane, PO9 1PP :, This is a group of students at all levels, beginners arrive throughout the year so we’re used to welcoming new people and the teaching is pitched to meet individual needs. Whilst I anticipate this class to be full from the current students who have first option, do get in touch if you’d like to join us, text me (it’s always on silent I won’t get your call) on 07552 758 552 or email me mary.noble@btinternet.com (copy & paste that, as clicking on it sends it to my spam box) and I’ll put you on the waiting list if I’m full. The 2000 Centre, St Johns Rd, HEDGE END, Southampton, SO30 4AF Wednesdays 1.15pm 0 3.15, Whilst this is an established class of experienced students, many of whom are members of Hampshire Calligraphers. Beginners are welcome if there is space, this class fills up quickly. All the longer-termers are very friendly! Please get in touch in case there are spaces in these classes. Denman College the WI college (but you don’t have to be a member of WI to attend)near Oxford, and Ardington School of Crafts which is a small independent school running a broad selection of mainly day workshops in a beautiful setting. 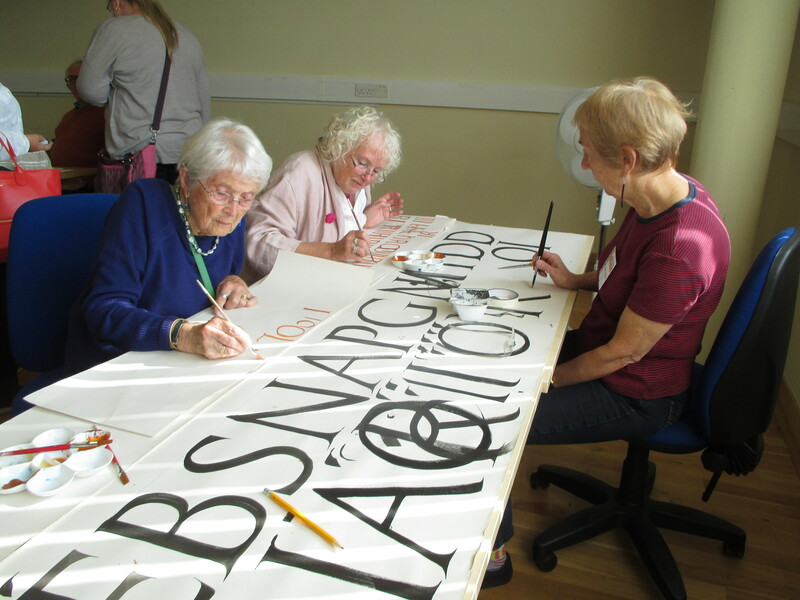 I also teach workshops for calligraphy groups across the country, but you usually have to be a member to take part – search for your nearest group or check the Calligraphy & Lettering Arts Society website for groups or tutors in your area. If you live in Hampshire, visit the Hampshire Calligraphers website www.hampshirecalligraphers.co.uk for details of local activities and tutors. The following topics are currently on offer for full day, weekend or longer workshops but I can devise others to suit groups’ needs and experience, get in touch and discuss your group’s needs. Back to Basics; Examine the ancestors of a particular script, get the underlying forms, then develop a version for today’s usage. Script could be Formal Italic, Roman Capitals, Foundational hand, modern Uncial , flat pen Uncial, Gothic, Rotunda, Batarde, Rustic, Carolingian. Flourishing Italic; suitable for those comfortable with formal Italic and ready to expand and develop confident flourishes; step by step techniques to gain confidence. Pressure and Release Pointed Pen Lettering (Italic, or Roman Capitals). Very fashionable now, getting away from the edged pen! But the pointed pen has totally different qualities giving quite different opportunities for calligraphic variants in any script. Bouncy Foundational. 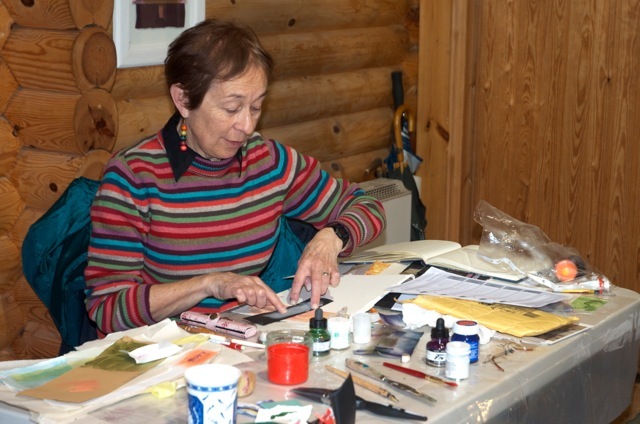 Some people find Foundational a little dull because of its formal qualities; this workshop shows that it has a lot of potential for liveliness just waiting to get out! 21st Century Capitals –so many variations. Roman Capitals have spawned so many wonderful contemporary variations, some monoline, some built-up, some ‘normal’ edged pen – all exciting to explore. 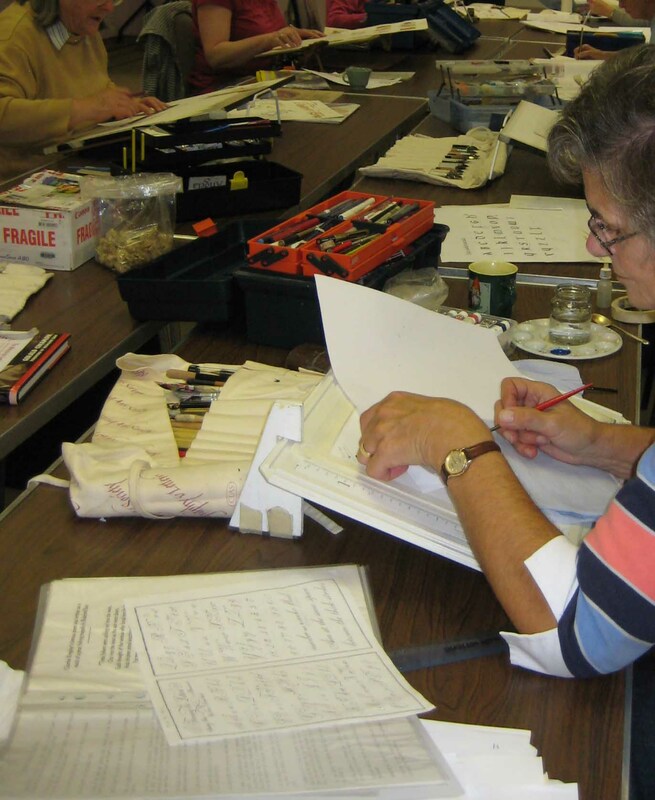 From Formal to Free: suitable for those who are confident in their letterforms, either capitals or italic, this workshop would be a series of exercises to liven the lettering to lively dancing, expressive writing and varying the pens. Writing with a Twist: manipulation for beginners. A step-by step introduction to developing lively writing by moving away from the carefully rigid standard pen angle for every stroke. Any script can have the treatment! Teeny Weenie Writing: techniques to maintain sharp well-formed lettering in very small sizes down to one millimetre, say for writing credits, or for those with a lot to write but no wall space! Introduction to the brush –pointed and broad-edged That sounds a lot to fit into one workshop and it really is only an introduction but I find people seem to gravitate to one or the other so it’s worth trying both! Brush Writing for pen Pushers: an introduction to the broad edged brush for students who already have experience of the edged pen. This could focus on classical Roman Capitals, or on more contemporary Italic lettering. Other variants for this subject would be writing with the brush on T shirts, or making banners, or focusing on a particular script, as the brush is very versatile. Pointed Brush Techniques; Using the pointed brush in contemporary lettering styles based on Italic. Suitable for those familiar with italic who are wanting to loosen up their writing and broaden their repertoire of tools and resultant scripts. Using Colour in the pen; mixing the colour you want instead of getting mud; putting colours together successfully; writing in colour on colour; colour change in the pen. Black and White. Exploring the impact of writing black on white and white on black, and combining the two for impact. Contrast and emphasis: exploring the text for suitable focus, combining contrasting weights and sizes, exploring variations in scripts for impact, and trying out layouts. Layout & Design: 3 ways round (at least!) When you’ve mastered a script the next issue is to make it sit well on the page. This workshop takes us through from standard layouts to becoming a bit more adventurous, and always remembering that we need that ‘active space’ to make it work! Bringing out your Inner Graphic Designer: Using contrast of scripts, sizes or weights, counterbalancing and other techniques, from poetry to posters to parking signs, this workshop deals with understanding how to arrange it so people notice it. Writing on Gold: simple techniques for using flat gold lead and other metals as a base for writing, creating sparkling areas of focus in a design. Writing with Gesso This one requires some patience, and a reasonable experience in a calligraphic script. Most raised gold in illumination uses gesso as the base, but it’s often put on with a paintbrush. 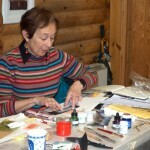 Writing in gesso opens up other possibilities with exciting textural results. How to use ‘Blobby pens’ They are those round-ended nibs that we used to eschew; they do have their uses however and we can explore the possibilities of monoline lettering that once were beloved of showcard designers – here we bring them into the 21st century.